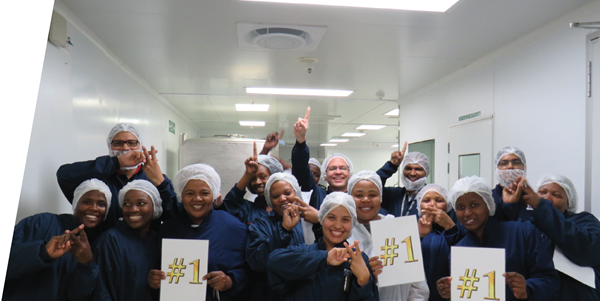 Port Elizabeth's solids manufacturing team is driving delivery improvement through four performance excellence behaviours in order to attain world class status. Our global team of skilled, accountable and passionate employees are critical to the success of the Group. We seek to attract, assess, develop and retain appropriately qualified and experienced individuals who present the right mix of technical and behavioural competencies for our targeted business requirements. We are also building sustainable structures that are agile and will allow us to compete and succeed consistently. A key initiative for the Group Human Resources department for this year was the implementation of the first year of the three-year human resources strategy approved toward the end of 2017. 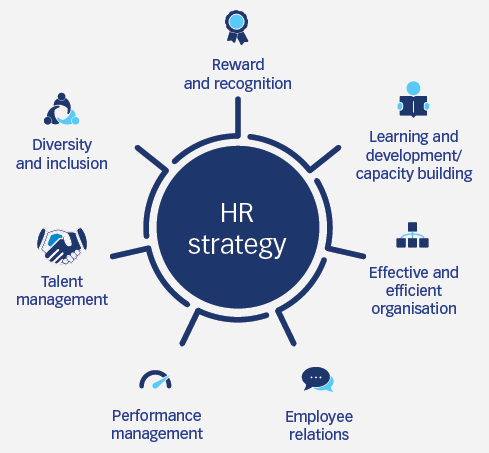 The human resources strategy, underpinned by seven strategic themes, aims to create an environment where fit-for-purpose human capital solutions have a global focus with localised relevancy. It has at its core the objective of fully integrated talent management, enhancing the employee experience by providing interesting, challenging and meaningful work, creating career growth opportunities, offering competitive and differentiated remuneration and ensuring an overall positive work environment. We pride ourselves in having committed and engaged employees. Following the global engagement survey conducted in 2017, we developed and implemented target action plans to address the key issues raised by our employees, which included career progression as well as training and development. Business units have now incorporated these actions into their annual delivery plan. Performance management processes are being enhanced across the Group to provide a more structured process to address employee developmental needs and to encourage dynamic career conversations. Good progress has been made to integrate employees who have been transferred to Aspen as a result of the anaesthetics acquisitions. As the Group continues to grow organically and acquisitively, the human resource function is evolving with the business to provide more integrated and relevant solutions. While aligning to the Group human resources strategy, policies and procedures, our decentralised human resources structures customise their policies to ensure local relevance and compliance with applicable labour legislation. Apart from implementing global frameworks, we successfully launched the global human resources system in 46 countries to date covering over 9 000 employees. This system, which serves as a Group platform for core employee data, is a strategic enabler for the implementation of the Group human resources strategy and related processes across the Group. We operate in environments where the labour markets are targeting talent and therefore we are subject to employee movement that is robust and dynamic. This puts us under pressure to retain and develop our current talent pool, while proactively sourcing talent in the various labour markets. In total, 1 479 employees were recruited to support business expansion requirements and to replace vacancies or fill new roles. 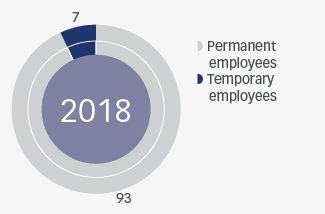 During the year, 25 employees retired due to non-work related ill health and reaching normal retirement age (less than 1,0% of the staff complement). No occupational fatalities occurred during the year (2017: none) but we regret to report the non-work-related deaths of 12 employees. Sadly, in one of these instances, an employee passed away while on duty and an investigation into the full circumstances is ongoing. We acknowledge the value that these individuals contributed to our success during their tenure. The Group's employee turnover rate has reduced to 12,3% (2017: 14,0%). While stable overall, attrition following the integration of the AstraZeneca and GSK sales force into Aspen China, while expected, did contribute to an increase in the voluntary turnover rate. We monitor turnover rates and conduct stay- and exit interviews to address retention risks early and ascertain why employees are leaving the organisation. During the year, restructuring took place in the South African Commercial business as well as in Oss, Australia and Mexico. In implementing the restructuring processes, detailed consultation plans were prepared to ensure that the correct consultations were held with affected employees and with the relevant labour organisations, such as unions and works councils. Our dynamic environment requires our employees to be adaptable, results-driven, self-motivated, decisive and responsive team players. All employees are provided with equal opportunities for development, advancement and promotion on merit and without prejudice. The R&N Co monitors the adequacy of succession plans for the Company's executive directors and the Group's senior executives. Succession plans are revised for key business unit executives and managers, while a new Group talent management strategy has been rolled out to drive talent attraction, assessment, retention and development across the business. The adequacy of these succession plans and the Group's talent planning landscape is monitored by the Senior Executives. Enabling this high performing culture is a performance management process that is in place across the business. The performance reviews are based on functional and business unit strategic objectives. During the year, performance appraisals were completed for 94,6% of permanent employees across the Group through formal one-on-one meetings between employees and responsible managers. Performance incentives and annual salary increases for assessed staff are determined with reference to the completed appraisals. Business unit managers are responsible for the implementation of effective training programmes to address identified skills development needs with the support of human resources departments. The Group human resources function supports business unit management teams to this end and monitors the adequacy of implemented training plans. In some of the business units, we use technology to support self-directed learning through the use of e-learning platforms. Technical and managerial skills have been identified as critical and these areas have continued to receive focus in this year. We established a technical skills academy at the Port Elizabeth site to focus on developing the capability of our front line, operational employees and to sustain a world class manufacturing site. We continued to provide fit-for-purpose programmes to build leadership and functional capacity and capability for organic and inorganic growth. In the South African and AGI business, 24 delegates successfully graduated from the Middle Management Development Programme, which was run in partnership with the University of Pretoria's Gordon Institute of Business Science ("GIBS"). Also in partnership with GIBS, we implemented the Junior Management Programme and 25 delegates from across the South African business graduated from this programme. In addition, 24 women from our East London and Port Elizabeth sites took part in a Women in Leadership programme which we conducted in partnership with Nelson Mandela University Business School. In Ireland, our leadership team was put through "The 5 Choices", a Franklin Covey time management programme, while in France, managers were trained in first line management skills. Training interventions across the Group have included short course training, internal training programmes, management and leadership development programmes as well as executive coaching programmes. In total 8 589 (2017: 7 426) employees were exposed to training interventions at an average cost of R6 742 (2017: R4 987) per employee. The total investment in training increased by 32,3% to R65,5 million (2017: R46,5 million). Average training spend per employee has increased over the previous reporting period due to significant capability development focus as well as enhanced reporting and monitoring of training. With a clear Group human resources strategy driving capability building, and a focused robust monitoring and evaluation process, we successfully implemented our planned training interventions for the year. In total 83 learners/apprentices were provided with funding during the year and 68 internships were implemented in the business. A combined total of 89 internships,apprenticeships and learnerships continue to be provided to employed and unemployed individuals. The South African Commercial business hosted a career fair for 100 students from different high schools, universities and various higher education institutions to provide career guidance to the students, while giving them exposure to the working environment. The hosting of a week-long legal workshop for 27 University of KwaZulu-Natal legal students during which Aspen professionals and executives covered various technical topics as well as skills needed to be successful in a corporate environment. In another initiative, human resources colleagues provided interview skills training to youth in a youth incubator. Financial assistance in the form of bursaries was awarded to 82 of our employees with a further 104 bursaries being awarded to external students in South Africa. Our external bursary scheme, with a total spend of R6 million, is directed toward the maintenance of a supply of relevant qualifications and skills to the industry in the future. As a signatory of the UN Global Compact, we are committed to upholding the labour principles included therein. Our working environments are free of prejudice, bias, harassment and/or violation. Our Code of Conduct entrenches the rights of all employees to be treated with fairness, equality and respect. Discrimination of employees on the basis of age, nationality, gender, race, physical health, sexual orientation, individual belief systems and/or any other prejudicial grounds is prohibited. Human resources, industrial relations and legal compliance frameworks are in place to uphold employee rights and ensure compliance with labour legislation. To further create an environment free from discrimination, we implemented a sexual harassment policy. Some business units supplemented the implementation of this policy through conducting sexual harassment training for their employees. During the year, no incidents of unfair discrimination were identified in the Group (2017: Nil). Employees are protected by local labour legislation and internal policies and practices to ensure appropriate hours of work and the management of overtime. We have put in place processes to mitigate the risk associated with excessive overtime and a new shift pattern at our Port Elizabeth and East London manufacturing sites will assist to reduce the overtime worked. Employee wage rates across the Group comply with legislated wage rates in the relevant jurisdictions and, where applicable, employees are paid in accordance with rates agreed upon with trade unions and/or collective bargaining councils. Salaries are benchmarked against industry standards in each territory to ensure that high performing employees are offered competitive remuneration packages that promote retention objectives. Our remuneration philosophy is detailed on remuneration and nomination committee report. Initiatives are also in place to provide formal and informal recognition to employees. We have a global employee recognition programme which celebrates employee excellence in the business. We have policies and procedures in place that encourage a productive employee relations environment, underpinned by pro-active and constructive working relationships with unions and works councils. Employees across the Group are free to exercise their rights to belong to trade unions and collective bargaining councils. Relationships with trade union representatives, considered key stakeholders, are managed in a proactive and responsible manner by local human resources managers. Formal processes are in place to foster a culture of transparency and constructive engagement with trade union representatives in each territory. Material operational changes are communicated to the employee trade unions, as necessary, within legislated timeframes. Formal grievance procedures are in place and are communicated to employees at each business unit. Another mechanism to address employees concerns over confidential matters, is the use of the whistle-blowers Tip offs line. This independently operated reporting outlet, provides employees with a channel to anonymously raise concerns in respect of matters related to unethical conduct, corruption and fraudulent activities. Our whistle-blower's policy and standard operating procedure provides guidance to prospective whistle-blowers and details the protections available to them, including protection against occupational detriment. 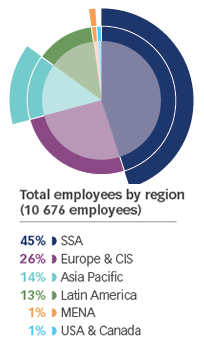 During 2018 approximately 27,3% of the Group's employees belonged to a trade union and 38,6% were represented by collective bargaining councils. We are committed to building an organisation that is reflective of the demographics of the countries and communities in which we operate, in order to harness strength from the many diverse talents and cultures in the Group. 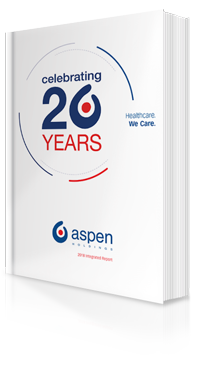 As at 30 June 2018, Aspen's team represented 47 different nationalities across six continents. In accordance with the Group's Code of Conduct available online, all employees are treated with fairness, equality and respect. The attraction, retention and development of female employees is a priority for the Group and gender diversity is a key performance indicator monitored by the S&E Co. We recognise that the advancement of women within our organisational structures is an important element in addressing gender equity. Accordingly, a new KPI: the percentage of women in the top 100 positions in the Group, has been introduced to measure our performance in this regard. This includes that women represent 27% of our leadership team, while female employees comprise 49,5% (2017: 49,4%) of the total workforce. To empower, engage and connect our female employees, women's forums were established in our respective South African businesses, with the intention to replicate this model globally. In line with our employment equity policy and talent management policies in South Africa, we implemented our new three-year employment equity plan. This plan was developed in conjunction with our South African businesses and in accordance with the Employment Equity Act and the BBBEE Codes to promote the advancement of historically disadvantaged individuals. Targets were set by taking into consideration staff turnover, growth and transformation rates after having consulted with the respective employment equity committees. Each business unit in South Africa has a transformation plan in place and employment equity committees meet regularly to drive delivery against agreed employment equity priorities. In South Africa, we have managed to retain the overall representation of black employees at 81,5%, a slight improvement from 2017. A key focus is to improve representation at a senior management level. We have, therefore, developed a new KPI measuring the percentage of black employees in the top 50 positions in South Africa. This indicates that historically disadvantaged individuals hold 22% of our most senior roles South Africa. 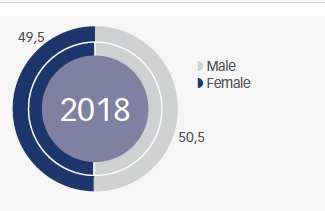 Representation of female employees in South Africa has declined slightly from 54,6% to 53,6% due to a high attrition rate. Employee health, wellness and fitness for work are fundamental to enable the effective execution of designated responsibilities and implementation of value-adding initiatives for the business. Employee benefit arrangements include subsidisation of tailored healthcare insurance plans for employees and their direct dependants where this is required. Employees at selected sites also have access to on-site clinics, employee assistance programmes and wellness support programmes. We are committed to promoting HIV/AIDS awareness and offering HIV/AIDS positive employees with the required counselling and support. Each year, we participate in World Aids Day on 1 December and World Tuberculosis Day on 24 March. Employee awareness of these diseases is created through the dissemination of information booklets, posters and making relevant information available electronically to staff. Our HIV/AIDS policy complies with legal guidelines and prescribes confidentiality of the employee's status. Free condom dispensers are installed in accessible areas across the South African and Kenyan sites. In South Africa, our HIV/AIDS management programme is administered by an independent health risk management company. Free HIV/AIDS testing is conducted every two years and is offered to all employees in South Africa. The HIV, Counselling and Testing campaign was last conducted in December 2016. Some 641 employees participated in the voluntary HIV AIDS testing and 667 participated in the voluntary counselling programme. HIV/AIDS positive employees have access to the disease management programmes through their healthcare insurance schemes which subsidise the provision of ARVs as well as voluntary counselling and support programmes. In South Africa, peer educators provide staff with necessary HIV/AIDS prevention and disease management training and, where required, this is also offered to family members of affected employees. Employees are entitled to a safe and healthy working environment and we are committed to ensuring the safety and security of all of our employees and third parties visiting our facilities. This principle is outlined in the Aspen Code of Conduct. The Aspen Code of Conduct for Suppliers and Service Providers echoes this commitment, detailing the expectations and requirements in terms of adhering to our safety standards both in their own workplace and when operating at one of our facilities. The Aspen Group Standard for Contractor Management further supports the identification, evaluation and control of risks associated with on-site contractor and sub-contractor activities. The prevention of work-related injuries, permanent disabling injuries and occupational diseases is a key focus area for site management teams, particularly at the manufacturing facilities where the inherent risks of health and safety incidents, including chemical exposure, are high. Health and safety baseline and issue-based risk assessments are conducted to identify and evaluate the magnitude of our health and safety risks through a dynamic, formal and structured process. Issue-based risk assessments are conducted for the management of changes and any new projects prior to the design phase to ensure that all health and safety risks are considered and mitigated. New operations acquired are systematically incorporated into the Aspen Group SHE programme. Due to the nature of pharmaceutical and chemical products, compliance control measures are in place across the supply chain, to address the safe and compliant handling and transport of all materials and products. SHE awareness and competency training programmes are conducted to promote the effective implementation and maintenance of SHE policies and procedures. Formal SHE representation and management structures are established at all manufacturing sites in order to create a platform of consultation and participation for the discussion and resolution of any SHE matters. SHE compliance is monitored and managed on a day-to-day basis and SHE KPIs form part of site management reporting processes. The Group SHE Department develops and promotes Aspen's SHE standards and monitors the compliance and effectiveness of certified SHE management systems across the business units. Independent SHE legal compliance audits are conducted annually across all manufacturing facilities. The Group SHE Department reviews the audit findings to establish trends and focus areas and tracks the status of corrective action plans. The Board monitors material SHE KPIs on a quarterly basis and, through the S&E Co, monitors the effectiveness and compliance of SHE management systems across the Group. In the interest of employee safety and asset security, access controls and security systems are in place across all manufacturing and commercial sites to prevent unauthorised entry. Additional measures are implemented by local management teams to ensure employee safety in countries where the risk of social and/or political unrest is high. We align our health and safety management systems to global standards, with 87,5% of the fully commercialised FDF facilities and 71,4% of the API manufacturing facilities within the Group continuing to comply with the OHSAS 18001 standard. As a result of the publication of the new ISO 45001 standard, which will replace OHSAS 18001, a phased plan is in place to implement ISO 45001 at the FCC Cape Town site by the end of 2019, while all sites currently certified to OHSAS 18001 will be transitioned to the new ISO 45001 standard by 2021. Due to the limited scale of their operations, the Sioux City and Ghana sites are not earmarked for certification. The OHSAS 18001 certificates and SHE policies for all internationally certified facilities are displayed across the manufacturing sites and are available online. Maintenance of an internationally recognised Health and Safety management system enables our sites to keep abreast of all applicable health and safety legal requirements, maintain a programme for evaluation of compliance and manage instances of non-conformance. Independent SHE compliance audits were performed at 16 of the Group's manufacturing sites during the year. The overall compliance results for 2018 were satisfactory with a 5,5% reduction in Health and Safety legal findings across the Group. All legal findings are managed by each facility through a formal Corrective and Preventative Action system and the Group SHE function monitors the compliance status and reports thereon to the S&E Co. The DIFR and LWDFR represent the Group's material health and safety KPIs. The DIFR reflects the percentage of employees who suffered disabling injuries in the 12 months ended 30 June 2018, irrespective of whether such incidents resulted in lost work days. The DIFR tolerance is set at less than or equal to 1,00 and a ratio of 0,82 was achieved. The LWDFR indicates the percentage of employees who were absent from work due to work-related disabling injuries over the last 12 months. LWDFR tolerance is set at less than or equal to 0,75 and a ratio of 0,78 was achieved. The tolerance levels are reviewed and approved by the S&E Co on a two-yearly cycle. During the year, 56 disabling incidents were recorded across the Group's manufacturing facilities compared to 64 incidents in the prior year. No occupational fatalities and two partial permanent disabling injuries occurred during the year. Continuing the positive downward trend in the disabling incidents from 2014, the Group managed to further reduce its DIFR below the tolerance level, while, despite further improvements, the LWDFR remains slightly above the tolerance level. Following root cause analyses performed on the higher rate of ergonomic related incidents noted in the prior year, interventions to reduce unsafe acts has resulted in a significant reduction (37.5%) of these types of incidents this year. Formal systems are in place to ensure that incidents are recorded, investigated and analysed in a structured and timely manner in order to identify root causes and prevent the recurrence of incidents. We are committed to the continual improvement of health and safety management and performance through reasonably practicable measures. Incident statistics are utilised as an input to the identification of improvement opportunities. Continual improvement is demonstrated by the establishment of measurable health and safety objectives which are regularly monitored to ensure achievement thereof. The status of the various continual improvement programmes is also discussed at employee Health & Safety Committee meetings.